Last month we exclusively reported that Stephen Wheatley, owner and director of the now suspended binary options provider City Odds Capital, was named by the U.S SEC in facilitating the illegal stock offering of a company capitalizing on Bob Marley’s fame to sell coffee. 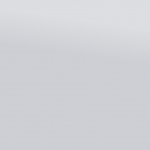 Now we can reveal that new evidence has uncovered that Wheatley is also tied with Go Markets. According to an investor presentation created in September 2015, obtained by Finance Magnates, Wheatley is named as the owner of the Go Markets Group which planned to seek an IPO on the National Stock Exchange of Australia (NSX) and get a dual listing on the Frankfurt Stock Exchange. The firm was soliciting investors, mainly from Australia and China (in 2014 it established a representative office in Shanghai), aiming to expand its business with investments in marketing and technology. 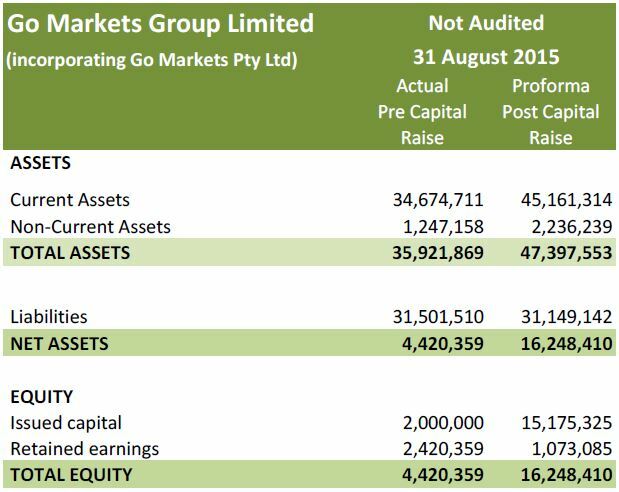 Go Markets Pty Ltd was incorporated in 1998, and is a wholly owned subsidiary of Go Markets Group Limited, which was incorporated in August 2015 to facilitate the listing. Go Markets Pty Ltd has been operating in the forex and CFD market since 2006, and holds an ASIC Financial Services Licence (AFSL: 254963). The group solicited investors with a valuation of $50 million. In the case of Marley Coffee, the SEC alleges that Shane Whittle, the company’s former CEO and director, orchestrated a ‘pump and dump’ scheme with other conspirators. It is alleged that in order to boost the stock price, they set up a sham financing arrangement designed to create the false appearance of legitimate third-party interest and investment in the company which raised millions of dollars through the sale of restricted common stock in 2011. According to a complaint filed by the Central District Court of California on November 17th, Wheatley was part of an offshore network of intermediates through which Whittle illegally distributed large blocks of Jammin’ Java stock. 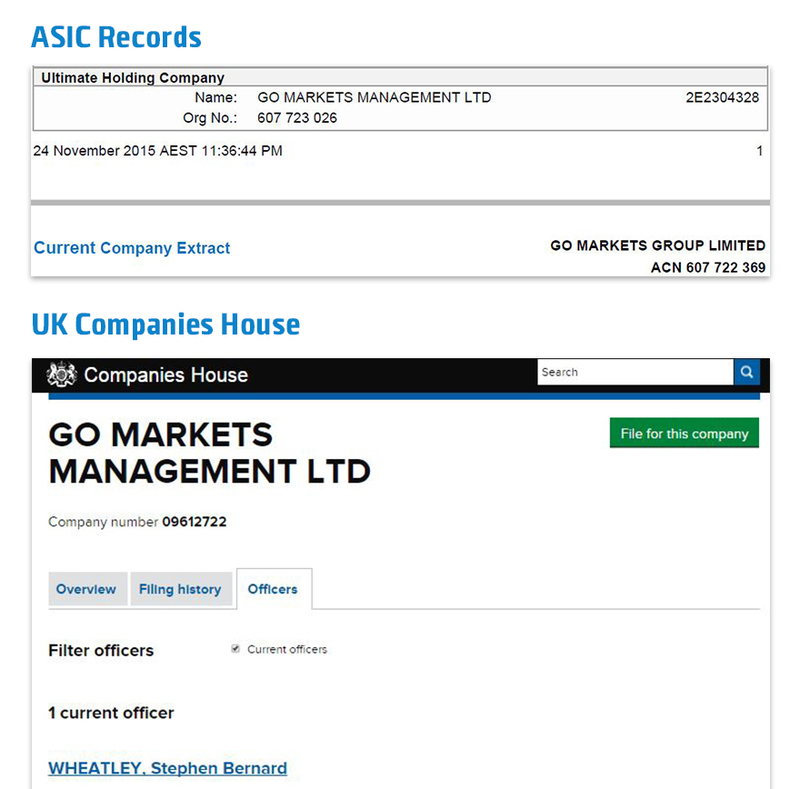 According to ASIC records, Go Markets Group’s ultimate shareholder is a UK entity called Go Markets Management LTD. The latter’s listing on the UK Company House shows that Wheatley is a director and a shareholder of the British entity. 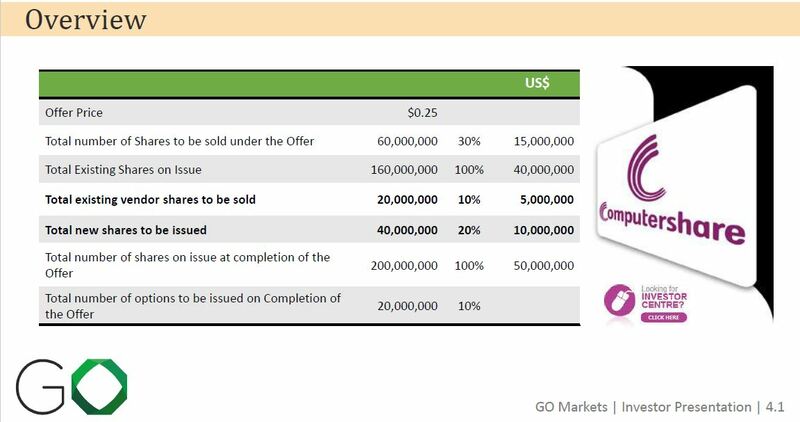 According to the presentation to potential investors in the firm, Go Markets Group boasts of having over 14,000 approved client accounts, 200% increase from 2015. 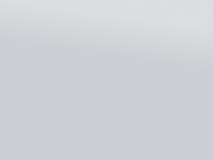 It also has over 200 introducing broker (IB) relationships. As of 31st August 2015 its income received from hedged trading represents 38% of total revenue, whereas unhedged trading income represents 61% of its total revenue. The presentation also contained the brokerage’s unaudited financial results, annualised as of September. 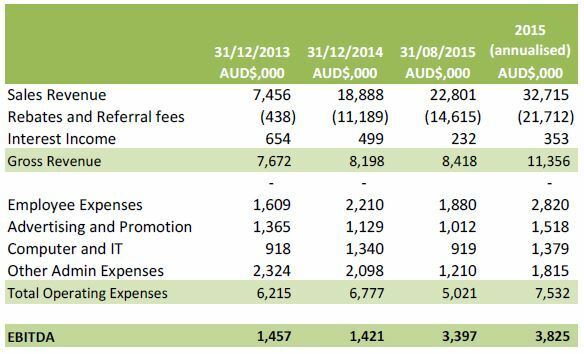 The firm expects revenues of over AUD32 million in 2015 and an EBIDTA of over AUD3.8 million (in USD terms over $23 million and $2.7 million respectively). Based on these figures we estimate the firm to be among the top fifty largest brokers in the world, although still smaller than rival firms such as FXPrimus and Pepperstone. Displaying an impressive growth rate, the group is looking to raise $15 million through the issuance of 40 million new shares, and the sale of 20 million existing shares, at a price of $0.25. 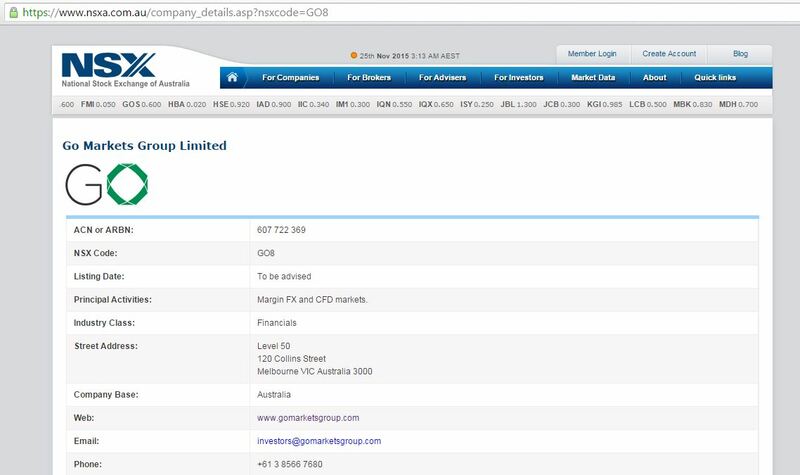 Interestingly, the information on the NSX website reveals that a claim has been made against Go Markets Pty Ltd by Citibank in February 2015. Citibank alleges that during the events of Black Thursday in January, Go Markets Pty Ltd breached its agreement, and demands $1,713,153 for FX trading losses. Go Markets Pty Ltd denies the allegations and says that Citibank caused or materially contributed to its own losses. Citibank’s London lawyers have in kind refuted Go Markets Pty Ltd stance and have asserted that Citibank’s Standard Terms and Conditions enable it to avoid such a duty and liability. The company knows that Citibank has a number of such claims and some are being defended or are in the process of negotiation. Go Markets Pty Ltd believes that Citibank will not wish to proceed with all of these claims and proceedings for commercial reasons and because there are some risks for it involved. The matter is still open. The Australian group established a connection with the FCA-regulated Go Markets UK soon after the SNB crisis that gave a fatal blow to a number of UK based brokers in January. 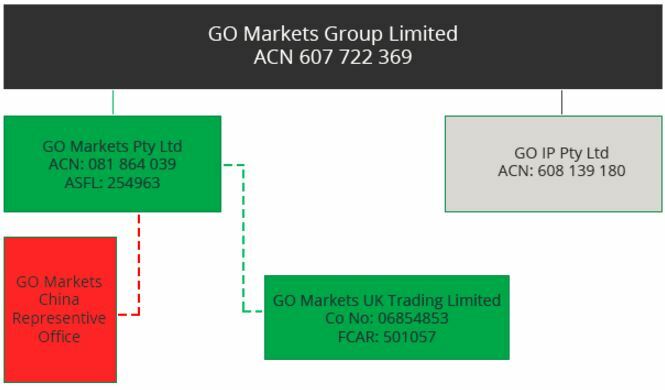 It states: “In February 2015 we formed an alliance with Go Markets UK Trading Limited, located in London.” However, Robert Berkeley, the owner of Go Markets UK, explained to Finance Magnates that the relationship between the firms is purely a white label agreement. Finance Magnates reached out to representatives of Stephen Wheatley and the numerous Go Markets entities. Wheatley’s US-based lawyer declined to comment as the matter is ongoing. As stated above the Go Markets UK CEO explained that the relationship between the firms is purely a white label agreement. 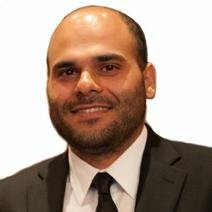 As for the promotion of the IPO they say: “The proposal to list on the NSX is currently under review and may be abandoned. Clearly, although Go Markets had no reason to know or suspect that charges were imminent or of the basis for them, the use of Wheatley in the material surrounding listing was extremely regrettable. Avi, great reporting! Keep it up. Good Job Avi & FM. Impressed with your research and findings. Did Citi get their money back? Wheatley also owns Vantage I believe.